Markets have kept up very well, despite being in a lunar red period. This increases the odds that we are going towards August highs for the US markets, but we have to see how we finish the red period later this week. The Nasdaq has climbed above 3600 and is still sitting near that level. Another push higher is likely in the next lunar green period, but it will have to come fairly quick as the Earl indicator has turned down already. The slower Earl2 is still positive for the moment, favoring such a final push upwards but not guaranteeing it. Well, I think fear of height is going to kick in when the market stalls at or near these all time highs (for many indices). In recent months there has been plenty talk about how money is flowing from bonds into stocks. But I think we will get an opposite move at some point. Long term bonds yielding 3 or 4% may start looking favorable compared to stocks that are already up 20% or more this year. When dividend yields for many stocks were higher than bond yields it was almost a no-brainer to buy stocks. But that situation has changed after the recent drop in bonds (which has pushed their yields up). I think that sets us up for a sideways period in stocks that will take us well into 2014. 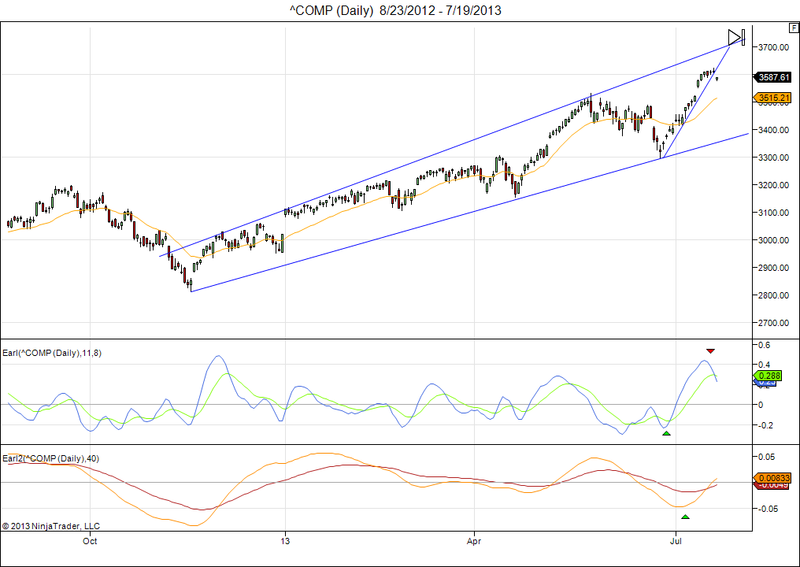 This entry was posted on July 22, 2013 at 1:02 pm	and is filed under Financial Astrology, Market Commentary. Tagged: Nasdaq, Stocks and Bonds. You can follow any responses to this entry through the RSS 2.0 feed. You can leave a response, or trackback from your own site.